Laser light shows have been something that I’ve taken my kids to yearly since they were little. Every Christmas, we’ll head down to the local Christmas market where at 9pm, they have an awesome light show. This year, I decided to do something a little different. I decided on purchasing my own outdoor laser light show projector. This way, my kids could enjoy the lasers any time then came home from school. As always, before I purchase anything, I do a huge amount of research into what the best light show projector available is. So, I’m here to share some of that research with you in hopes that it can help you figure out what the best option is for you, too. You don’t need a laser light projector, but they can prove a hit if you’re thinking about having friends and family over for Christmas. So, let’s have a look at some of the best outdoor Christmas laser light show projectors that are available right now. What should I look for in a projector? Finding an outdoor laser projector doesn’t have to be difficult. Sure, there are a few different ones on the market to pick from, but as long as you know what it is you’re looking for you should be fine. The majority of projectors here are usable not only for Christmas, but other times of the year too. This means that it doesn’t have to stay wrapped up in the cupboard every month except December! This is an honest review, and if there’s anything you disagree with please feel free to leave me a comment at the bottom. So, lets have a look at the best outdoor Christmas laser light show projector. In the end, I just wanted something really simple to give the kids a little bit of light entertainment. They’re both at the age where any sort of flashing lights are going to impress them, and this Snowflake projector seemed to do a good job. 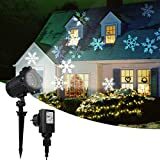 【More Brighter and Clarity】: Upgraded Version Interchangeable Rotating Snowflake & Snowfall Projector Light is the Newest Unique Design, Made of High Luminous Efficiency Led Chip Which More Brighter and Clarity, Creating More Realistic and Vivid Snowy Atmosphere in Christmas Or Other Holidays and Party! 【Use Friendly Design】: Greenclick Decoration Projector Lights Design of 26.5-32.8 ft Projection Distance to be Adjusted to Get the Best Effect. Super-Length Extension Cord of 26.5 ft will Easily Reach Most Outside Home Outlets From Where you Set it Up. 2 Mounting Ways Easy to Set up, It Comes Plug and Play ready! 【Automatic Timer and Wireless Remote】: Built-in Timer and Daily Circulation, the Christmas Projector Light will be 2/4/6 hours on and 22/20/18 hours off. With Handy Wireless RF Controller from up to 32.8ft Away and It can be Controlled Even Through the Windows. A few good things that I really like about the GreenClick snowflake projector. Firstly, it’s totally waterproof. Of course, you’d expect all projectors to be waterproof right? Well, apparently not all of them are (*cough* Star Shower *cough*). So, getting one that was going to survive in all weathers was essential for me as we live in a super cold and wet area of the country. The pack comes with a remote control (ideal), different modes that you can set your projector to and quite importantly, it’s really easy to adjust. This means that you can easily rotate the device once it’s secure, which is an issue with other projectors. Here’s a video of the Greenclick in action. Although I use the projector at a close range, it does have up to around 30ft projection. This projection from this level is a lot less clear. If I’m thinking from a negative perspective, then the only thing that I can think of is that this might not be enough if you want to cover a full house. I use this on my front door area and it works a treat, but the lights wouldn’t be as effective if I pushed it further back. Of course, it’s in a specific snowflake style as well, and you might be looking for a more ‘laser’ effect. Don’t worry – I’ve included some of those, too. But for me, this was the best option available for my needs. I get it – snowflakes aren’t for everyone. So if you’re looking to project an image that isn’t just snowflakes, then you could consider looking at the GAXmi pattern projector. 【Vivid Animation Effect】Unlike other projector (old version), this LED animated light projects virtually animated patterns onto the wall. The 4 patterns are shifting like vivid animation. The innovative light effect is totally different from the simple one pattern moving around as in old version projector light. 【Fairy Snow Falling Effect】 With many rotating white spots, the pattern looks like snow flurries falling down from the dark sky. With remote controller, it is easy to create romantic night light display especially at wedding, Christmas, and other festivals or occasions. 【Remote Control】 This remote controller is designed with various functions. It is able to control light modes, speed, music/sound, timer, etc. As well as the ability to project small snowballs onto your house, you’ll also have the ability to show one of 8 different patterns. Half of them are Christmas patterns, whilst the other half are actually halloween patterns. This makes this projector a great choice if you’re looking for something you can get multiple uses out of. Another thing that I really liked about the GAXmi projector is that you can easily use a memory card to play your own music through it. This isn’t the case with the majority of projectors, and this felt like a nice added touch. The one thing that put me off this model is that I wanted something that came with a remote control. Although it says on the listing this one comes with a control, looking at the reviews it seems a lot of people didn’t get a remote through with it. 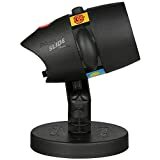 A bit annoying, but nevertheless another pretty decent option if you’re looking for a Christmas and Halloween Light Projector. If you’re looking for a more typical laser light projector, then this one from Yunlights is likely to be a good choice for you. It’s the standard red and green laser effect, which is what many people are after. SPECTACULAR DECORATIVE LIGHTS FOR HOLIDAYS! 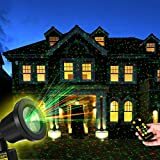 Just set up this light projector in your yard, and the whole front of your house will be covered with thousands of moving colored spots of light. THE BEST HOLIDAY LIGHTS ARE ALSO THE EASIEST! No strings of lights to untangle and hang, no ladders, nothing to assemble. Just one device to plug in and place on the ground. You're done! MULTIPLE MODES AND A LONG-RANGE REMOTE. Choose from static or moving lights, all one color or mixed, steady or flashing, etc. And you can control all the different modes from inside your home. You don’t necessarily have to use this at Christmas – you can use it at pretty much any time of the year. These are exactly the types of laser lights that arise questions around safety, though if you buy them from a trusted retailer you’ll never have to worry about that. What I did like about this set is that it comes with a long range remote, which is an essential for some people and not a big deal for others. It’s stated that you can also use this set indoors, but it’s ideally suited for outdoors environments as the lasers it uses will work at a good distance and cover a pretty wide area. Overall, I didn’t go for the Yunlights product because it just wasn’t the style I was looking for. I have enough fun with red and green lasers around my house, so I didn’t want to continue to add to that by introducing even more lasers! One of the other major considerations that I looked at when considering an outdoor laser projector is this one from Innoo Tech. 【Simple Installation】--- Just simply set it up and adjust it to the best projection angle within 5 minutes, you can choose what pattern and design you want to project by simply using the remote control. Fastest way to create different lighting effect to decorate Christmas, Halloween, holiday entertainment, parties, landscape decoration. 【Projection Distance】--- The laser lights makes a great display shining up on trees and houses covering over 2500 square feet from 30-40ft away. 【Spinning Option】--- Laser lighting effect selection: freeze, strobe or rotate; Color selections: single red, single green or red&green. With built in timer, you can select a timer interval as to how long this unit will stay on ( 1,2,3,4,5,6 hrs). I considered this one quite a lot, mainly because it’s not just an outdoors Christmas projector. You can actually use it for a ton of other stuff too, which is particularly impressive. Of course, you could probably use a normal Christmas laser projector at other times of the year. But the multiple patterns that this projector comes with make it good for any night, not just Christmas. There’s actually two different variations of this product that you’ll want to consider. They have both the standard laser lights set, but also a set that can project patterns onto the wall. Combining the two might be a good idea for those looking to particularly impress the neighbours. Whilst I’ve listed the first set, you can find the second pattern set here . This set comes with 15 different slides, with 5 of them ideal for Christmas. It comes with a remote (so you can turn it on from the inside easily, and you can easily speed or slow the system down with the flash and motor settings. It also has a handy timer too if you’re going to be heading out and want it on when you arrive home. Overall, this is another good set and as Christmas is approaching closely, I’m considering purchasing it for this years festivities alongside my GreenClick projector. Star Shower still makes the list due to it’s insane popularity, but in my opinion, it isn’t the best option for Christmas light projectors. Why? Well, just have a look at the reviews of the Star Shower online. Want to know the main reason that I’m opposed to the Star Shower? The advertising. We’ve probably all seen it advertised on television at some point during the Christmas holidays. But what you probably don’t know is that the house they use in the advert is not just covered by one Star Shower projector – it’s more like two or three! That means that to get the same effect, you’ll need to buy two or three of these. A little bit of sneaky advertising, in my opinion. Not only this, but after reading the reviews online there are a lot of people complaining about the lack of quality in the product. A big mixture of people complaining about it only lasting one seasons, and the rain and moisture having a big effect on the lights themselves. It’s a Christmas projector.. surely it’s meant to be weatherproof? Anyway, after reading these reviews the Star Shower turned into a massive no from me. But, I thought I’d add this in here to let you know. Here, I’m going to run through a lot of the questions that I first had when I looked at purchasing a Christmas projector. Hopefully, this should help to alleviate any worries you have an answer any queries. Laser light projectors are designed in a way that makes them safe to use. Most people worry that the lasers in the projector make cause a fire, but due to the power of the lasers this is not going to happen. Anither concern is that it may have an effect on passing drivers and even aircrafts. As long as you’re pointing them at your house and not way from it, this shouldn’t be an issue. When you’re buying a light projector, there are a few things that you’ll want to consider before you go ahead with any purchase. Style – One of the most important things for you to consider is the style of your laser light projector. The majority of projectors come in the standard green and red laser fashion, which gives you a Christmassy feel. But, you should also consider image projectors too. These work well for showing a full image, as opposed to just laser dots. Waterproof – All outdoor laser projectors should be waterproof – I think we can agree on that, at least. 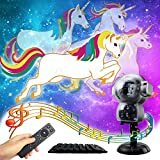 So, double check the reviews online prior to any purchase because it seems like some products out there do not stand up to the test of time. Cost – Of course, the cost of a Christmas laser projector needs to be considered too. Fortunately, the majority of projectors out there are below $50 so this isn’t too much of an issue. You can find other laser light projectors out there that cost more than this, but for most people they aren’t really necessary. Power – Everyone assumes that if you get yourself a laser projector for Christmas, it’s going to work perfectly no matter what. This isn’t necessarily the case, as some projectors are designed for certain distances. For example, the projector I ended up buying would be perfect for a smaller house – but it’s not going to work for a five bed detached. So, it’s worth keeping in mind what you need and to check the specifications of your projector to see it will work for your house. 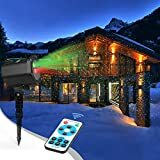 Overall, there actually isn’t a great deal out there for people that are looking for an outdoors Christmas laser projector. The majority of the ones on the market seem to be all shipped in from China, which is fine for me as it helps to keep the cost down. But, there isn’t really a big brand that stands out from the crowd in terms of quality and effectiveness. So, your best best is to have a look through the ones that I’ve suggested and see what type of projector it is that you’re going to need. Do you want something that’s like the typical device, green and red laser dots, or something a little different? Either way, there’s going to be something suitable to your needs.